Richard Yates, Governor of Illinois from 1861-1865, was a formidable man, as demonstrated by the fact that during his term of office Illinois sent off a quarter of a million men to fight for the Union, the third most of all the States, in spite of the fact that copperhead sentiment was rife in southern Illinois throughout the War. Born in Warsaw, Kentucky in 1815, Yates moved with his family to Illinois in 1831. A college graduate at a time when such was a rare accomplishment on the frontier, Yates began practicing law in Jacksonville, Illinois in 1837. 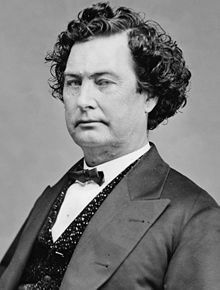 An anti-slavery Whig, Yates served in both the Illinois House and in Congress.